One of the most notorious and controversial services of the East German state was the Grenztruppen der DDR (Border Troops of the German Democratic Republic). At it's peak, the force numbered 47,000 soldiers tasked with patrolling East Germany's borders and repressing any attempt at escaping the communist state. The Grenztruppen was the primary agency tasked with guarding the Berlin Wall and the Inner German Border Zone with West Germany. 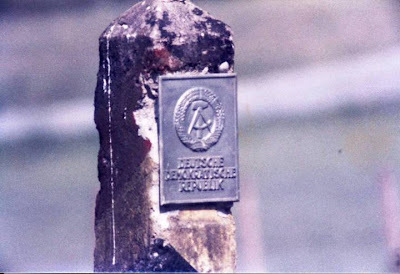 Beyond the Soviet Union, no other country in the Warsaw Pact had a border guard force as large as East Germany. Subsequently, the Grenztruppen was responsible for many deaths along the Berlin Wall and the Inner German Border Zone. The Grenztruppen der DDR was officially created in 1961, after a complete reorganization of the Deutsche Grenzpolizei (German Border Police) an agency which was created under the supervision of the Soviet Union in 1946. The Grenztruppen were reorganized along the lines of their Soviet counterparts the Border Troops of the USSR. As part of this reorganization and restructuring the Grenztruppen were realigned from the Ministerium der Innern (Ministry of the Interior) and given the status of the fourth armed force under the National Volksarmee (National People's Army). In 1973, they were removed from the control of the National Volksarmee and aligned directly under the Ministerium für Nationale Verteidigung (Ministry of National Defense) or MfNV. With the construction of the Berlin Wall in 1961 and closure of the Inner German Border with West Germany, East Germany essentially became a prison state and the Grenztruppen were the guards of that prison tasked with subduing all would be escape attempts from the East German republic into the West or into other Warsaw Pact nations. Although they wore the standard stone grey colored uniforms of the National Volksarmee they adopted their own waffenfarbe color of dark green arm-of-service color. On their service and dress uniforms they wore a distinctive green cuff title with white lettering reading 'Grenztruppen der DDR' on the cuff of the left sleeve. From 1973 on, service in the Grenztruppen der DDR was voluntary and no draftees involuntarily served in its ranks after 1973, as opposed to the National Volksarmee. The majority of the Grenztruppen troop strength was concentrated along the border with West Germany in comparison to a mere force of 600 troops monitoring East Germany's borders with Poland and Czechoslovakia. For most western travellers, their exposure to the Grenztruppen personnel was through the Paß- und Kontrolleinheiten - PKE or Pass & Control units assigned to the designated Grenztruppen Grenzübergangsstellen (border crossing points) across East Germany and East Berlin. These troops processed travellers and although they served with the Grenztruppen they were actually members of the Hauptabteilung VI ( 6th Main Department) of the infamous Stasi, the Ministerium für Staatssicherheit der DDR( (Ministry of State Security) effectively East Germany's secret police force. Border Troop regiments were trained similar to the regular infantry units of the National Volksarmee, but were generally more lighter equipped than comparable Landstreitkräfte infantry formations, with their heaviest weapon being the RPG-7 grenade launcher. In an attempt to increase their capability to search for persons attempting to flee the GDR, most units had German Shepherd dogs. A regiment consisted of around 1,500 men divided into three battalions of four companies each. These regiments also had an anti-tank battery, a mortar battery and an engineer company. The units of the Grenzkommando Mitte were mechanized, with PSzH-IV and FUG armored vehicles. - First, to call out "Halt, stehenbleiben, oder ich schieße!" ("Stop, stand still or I will shoot"). - Next, to fire a warning shot; typically the border police carried Kalashnikov AK-47 assault rifles. - Finally, if the fugitive failed to comply, an aimed shot, preferably aimed at the legs, was to be fired to stop the person. The border troops were told to avoid shooting in the direction of the territory of West Berlin and West Germany. Recently uncovered evidence shows that not even children were spared under the shoot to kill order. After an unsuccessful escape attempt in which a fugitive was shot, the shooter would be rewarded and granted a special leave. In some circumstances awarded a gold watch as a gift from the SED communist party. Any incidents along the border region were kept secret. Often the soldier would be transferred to another military unit and ordered to keep silent about his exploits. 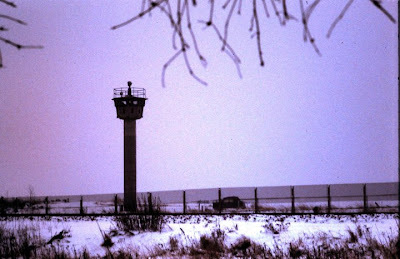 In retrospect when a fugitive successfully crossed the border, harsh disciplinary measures were taken against border guards often including prison terms in the infamous military prison at Schwedt. Many soldiers tried to avoid being accused of letting a fugitive escape by deliberately shooting off-target. 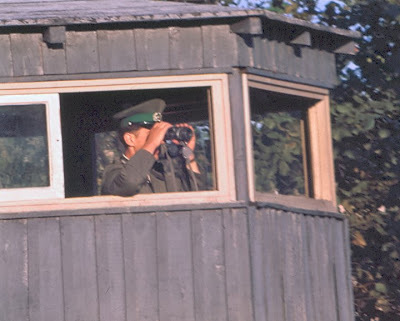 A Grenztruppen der DDR soldier monitors the border region through a pair of binoculars from one of many observation towers lining the Inner German Border in an attempt by the East German government to prevent its citizens from escaping into the West. Each attempted or successful escape was followed by a formal investigation by the military prosecution authority and the Stasi. When would-be escapees were killed, strict regulations were imposed on the victim's family regarding the funeral service; for example no obituaries for the deceased were allowed to be printed in local newspapers. East German law only allowed crossing the border at designated checkpoints known as Grenzübergangsstellen, such as Checkpoint Charlie. Elsewhere, warning signs were posted telling people not to enter the border strip. Any violation was considered a criminal act and was punishable by death under the sentence of Republikflucht essentially "desertion from the republic". The uniform displayed here shows uniforms of an Oberstleutnant (Lieutenant Colonel) in the Grenztruppen der DDR (Border Troops of the German Democratic Republic). Like conventional military units of the NVA, Grenztruppen personnel wore rank grades similar to the armed forces and maintained a similar system of waffenfarbe for their respective organization. Note the dark green piping signifying the wearer's affiliation of the Grenztruppen. The Grenztruppen uniform is of the same distinctive stone grey color of all East German military uniforms. The visor cap shown here for a Grenztruppen officer in the stone grey color of National Volksarmee uniforms along with its associated dark green piping of the Grenztruppen der DDR. It retains the East German national roundel in the center surrounded by a metal wreath insignia and officer's silver braiding cap cord around the base above the visor. Note the interior marking of NVA for the East German National Volksarmee. This visor example shown here carries a letter 'L' designation meaning the visor was manufactured in 1973, the letter L was also used again for visors manufacturerd in 1987. The number beneath the NVA stamp represents the size of the hat in centimeters, this example is 56cm or roughly 7in by American sizing equivalents. Shown here is the Kragenspiegeln (Collar Insignia) of a Grenztruppen officer. It is of the silver bar type which is standard to all officer uniforms of East Germany but with respective green interior of the Grenztruppen against a black background signifying it's status as an armed service. Shown here is a close up of the shoulderboard insignia for a Oberstleutnant (Lieutenant Colonel) in the Grenztruppen with the silver officer braiding and gold pips of a senior officer against the green backing of the Grenztruppen. Shown here worn over the left breast of the dress tunic is the Medaille für Reservisten der Nationalen Volksarmee in Gold (Medal for Reservists in the National People's Army in Gold). The pin back hangar is of metal in black, red and gold the colors of the German flag with the East German coat of arms bearing a hammer and compass in a round with the words NVA underneath and an image of an NVA soldier complete with field helmet and the inscription "Reservist der Nationalen Volksarmee" (Reservist of the National People's Army). On the left side of the dress tunic was worn a ribbon bar, this example using paper ribbons protected by a hard plastic and pinned against above the left breast pocket of the tunic to display the awards presented to the soldier. Shown here on the chest of this jacket is the Verdienstmedaille der Grenztruppen der DDR in Gold (Merit Medal of the Border Troops of the GDR in Gold), Verdienstmedaille der Grenztruppen der DDR in Silber (Merit Medal of the Border Troops of the GDR in Silver), Verdienstmedaille der Nationalen Volksarmee in Bronze (Merit Medal of the National People's Army in Bronze), Medaille für vorbildlichen Grenzdienst (Medal for Exemplary Border Service), Medaille für Treue Dienste der Grenztruppen 20 Jahre (Medal for Long Service in the Border Troops 20 Years), Medaille für Treue Dienste der Grenztruppen 15 Jahre (Medal for Long Service in the Border Troops 15 Years), Medaille für Treue Dienste der Grenztruppen 10 Jahre (Medal for Long Service in the Border Troops 10 Years) & the Medaille für Treue Dienste der Grenztruppen 5 Jahre (Medal for Long Service in the Border Troops 5 Years). Displayed here is a close up of the distinctive 'Grenztruppen der DDR' Ärmelstreifen (Cuff Title). Cuff titles were a form of insignia placed on the sleeve of German military and paramilitary uniforms, first noticed during the Second World War during their use by specialized units of the Wehrmacht such as the Waffen SS. The East German Nationale Volksarmee continued the tradition of cuff titles, most notably worn by specialized and elite duty units such as the Border Guards and Guard Regiments which were named after famous German communists. The cuff title is around 18 inches/ 45cm long and sewn onto the left sleeve. This cuffband is of the distinctive dark green arm-of-service color with the branch of service 'Grenztruppen der DDR' stitched against the background in white lettering. Displayed here is the gray dress shirt issued to regular soldiers in the armed forces for wearing underneath the uniform tunic along with the dark grey NVA tie and the stone grey trousers worn by the Grenztruppen complete with the green piping running down the length of the pant leg. On certain occasions the jacket could be removed and this variant of the uniform worn. All shirts in the East German government had loops on the shoulder for mounting rank shoulderboards when not wearing the jacket. In summer and warm climates, the tie could be removed and the shirt collar worn open. A close up of the grey NVA service tie. The stone grey service trousers worn by NVA and Grenztruppen personnel, this distinguishing mark of Grenztruppen trousers being the green stripe running along the length of the pant leg as seen here. The interior of the trousers shows a stamping of the NVA with the size tag of M 48-1. The M being the letter code for Average Height, and the 48-1 being the code for slightly larger than average but the equivalent of a size 33-36 waist in American equivalent charts. During parades such as the annual Ehrenparade (Honor Parade) commemorating the founding of the East German nation in 1949, the straight legged trousers were replaced with riding breeches, the ends of which were wore inside the tall length of the polished black jackboots. The breeches being a distinct tradition inherited from the Prussian Army. Also worn would be a thick leather belt around the waist of the service tunic. Here is a close up shot of the NVA breeches, all breeches regardless of service were worn unpiped with no striping along the legs. Breeches were seen as a distinctive German military trait and were maintained throughout the existence of the NVA until its collapse in 1990 despite it's often misaffiliation with the Nazi Wehrmacht of the previous regime. Here is a close up of the brown leather belt worn around the waist of the service tunic. Adusting the belt to size was made possible by a sliding loop and secured using two metal prongs which secured through holes in the belt. Displayed here is the stamping of the belt as issued by the National Volksarmee with it's size being (to the outermost belt holes) Size 110 or 40" in American measurements and 100.4cm in British/European measurements. Also note the name 'Friedrich' possibly of a former soldier written on the inside of the belt. Shown here is a picture of the belt around the waist and secured about the midsection of the service tunic. In winter time, all NVA personnel were issued a Wintermantel (Great Coat) gabardine (smooth fabric) grey-green overcoats. In some instances, Grenztruppen der DDR cuff titles were added on to the left sleeve of the Wintermantel as well. All great coats maintained loops for attaching shoulder insignia when worn over the service tunic. The main difference between the overcoats worn by conscripts and other non-career soldiers and those above is that the basic fabric of the non-career overcoats was wool instead of gabardine, which gave them a courser appearance than the more polished look of gabardine. A close up picture of the he collar of the Great Coat notice the thickness in construction of the coat to retain warmth in the chilling European winters. The interior displaying the sewn in liner of the coat. Mounting holes and slots for mounting rank shoulderboards to the coat. All ranks of the East German armed services wore shoulderboards to display ranks. Here is a close up picture of the six button smooth pebbled silver button arrangement of the double breasted coat. In winter conditions, the visor cap was also substituted for a light grey colored ushanka hat reflective of Soviet armed forces, the hat was made of a synthetic fur material and had detachable ear flaps that could be worn down to protect the ears during cold weather. In the center of the ushanka face is like on the visor caps a metal cockade insignia of the East German coat of arms and a silver wreath signifying an officer. 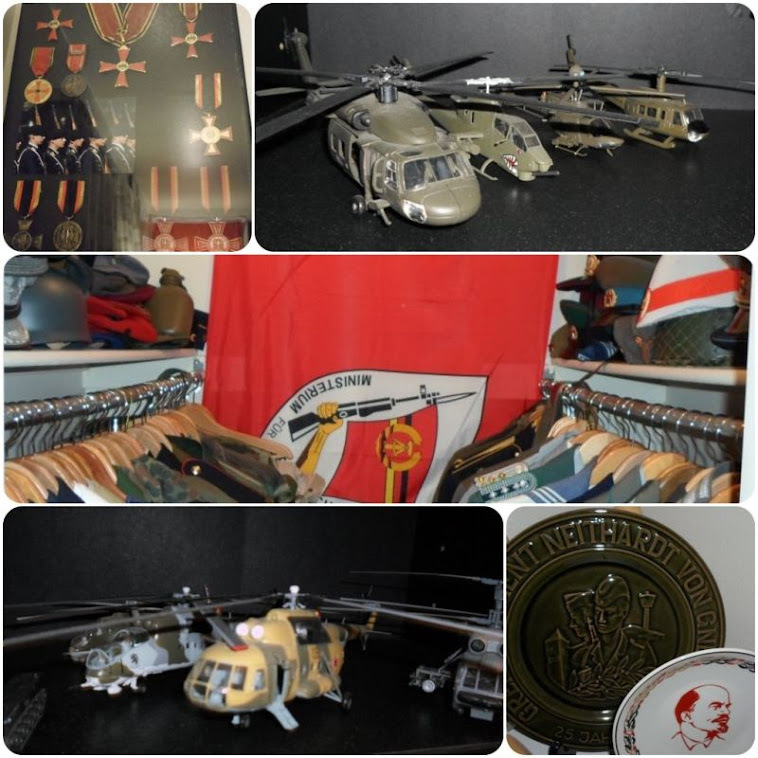 The East German SED communist party issued many commemorative items and memorabilia in honor of service to the GDR state. Most prominent of these were Ehrenteller (Honor Plates).Many of these commemorated specific milestones of particular units in service of duty to East Germany. This usually came with fixed mounting areas for ease of hanging and display within the home or office. The plate shown here is for the Grenzregiment Neithardt von Gneisenau (Border Regiment Neithardt von Gneisenau) celebrating 25 Years in service of the East German state. The plate is Olive drab green the official color of the Grenztruppen being green and features two Border Guard soldiers with a DDR boundary marker in the front and a Grenztruppen watch tower in the background. It measures roughly 9.75 inches (24.1 cm). Here is a close up of the centerpiece of the plate showing the detail of the border marker, the soldiers and the relief of the border watch tower behind them. Also note the palm leaf which is supposed to signify peace as the Grenztruppen were seen as 'protecting the East German people from fascist aggression from the West' it is ironic considering the Grenztruppen were responsible for many deaths along the Berlin Wall and the Inner German Border Zone with West Germany as they shot would be deserters attempting to flee East Germany for freedom in the West. Here is a shot of the back of the plate. An East German observation tower along the Inner German Border Zone from which Grenztruppen soldiers monitored the border ever vigilant for any signs of would be deserters attempting to escape to the West. 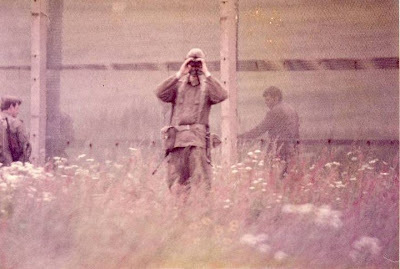 A Grenztruppen soldier in his field uniform stares across the border monitoring Allies border patrol forces along the Inner German Border Zone. A motorized reconnaissance unit of the Grenztruppen pause for a break in a patrol somewhere along the sensitive border area. 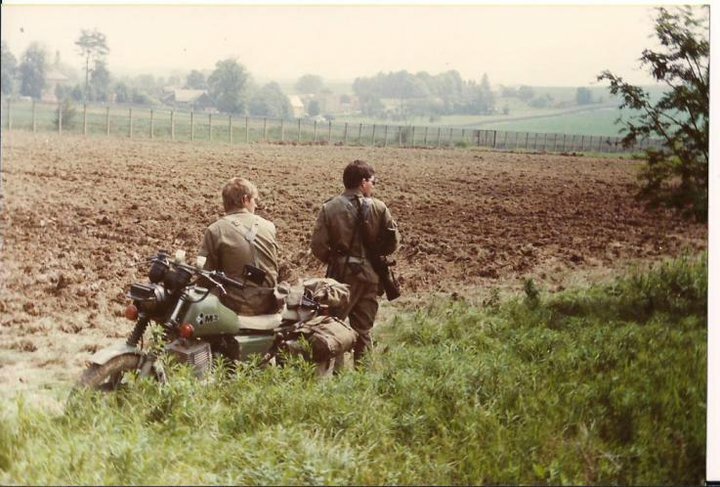 What's ironic about this picture is that these soldiers are actually on West German territory.